Help Nicole find her father! Join Nicole and her sidekick, Igor, as they trek across the globe in search of her missing father! Discover a secret so big that it could threaten the very course of human history. Solve puzzles from Nicole's home in New York City to distant lands around the world on a quest to find her beloved father and save humankind. 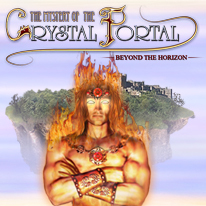 Solve interactive puzzles and find hidden objects galore in Mystery of the Crystal Portal - Beyond the Horizon.